Book TV: David Keene, What Are You Reading? The founder and chairman of CPAC shares his reading with Book TV. Read more about Book TV: David Keene, What Are You Reading? 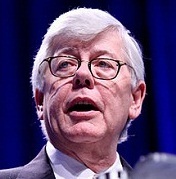 On June 8, 2012, the National Rifle Association (NRA) hosted a panel entitled "Defending Self-Defense: The Liberals' Shadow War on the Second Amendment" at a Conservative Political Action Conference (CPAC) event in Chicago.